I never thought I would have an English best friend, but then Angie Braddock arrived in Rolling Brook with her outgoing personality and Texas attitude. I couldn’t help but like her. She’s funny and has the biggest heart of anyone I know. She’s always willing to go out on a limb for people she barely knows. In fact, she agreed to be a Rolling Brook township trustee just to protect the Amish interests in the township. Angie isn’t Amish, but her late aunt Eleanor was. Angie has a soft spot in her heart for our culture that few Englischers have. Despite her love for the Amish, Angie is Englisch through and through and is always trying to coax me into new ideas—ideas that would have never occurred to me as an Amish wife and mother. For one, Angie tells me to share my famiy's baking recipes from our bakery, Millers Amish Bakery, with others. She even suggested I write an Amish cookbook to sell! Can you imagine me as an author? I can’t take credit for the Miller family recipes. Those recipes were passed down through my husband’s family. Then again, I do have one recipe that is my own: Sour Cream Cookies. Since the holidays aren’t that far away, I thought I would share it with you. It’s terribly easy, and the cookies melt in your mouth. Maybe I will write that cookbook after all. Do you think I should? Cream sugar and butter. Add egg. Alternate adding dry ingredients and sour cream and beat until smooth. Spray cookie sheet with baking spray. Using a teaspoon, drop cookie dough onto sheet. Sprinkle with colored sugar or cinnamon-sugar. Bake at 375 degrees F for 12-15 minutes. Murder, Served Simply (Amish Quilt Shop #3) release December 2nd! Thank you! They look yummy. I'll bake some to serve in my shop this week! These look delicious. I'm definitely planning to try them. 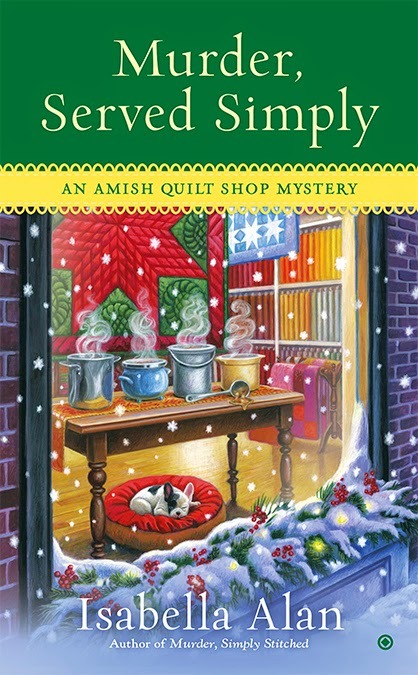 And, I really enjoy the Amish Quilt Shop Mysteries! Yum. And drop cookies are the best - no rolling or cutting out! Yes, write the cookbook! Can't wait to meet you when you come to Ashtabula County District Library. You do a great job in writing about Amish life from a commoner's view.